Camp Michigania is a magical place. 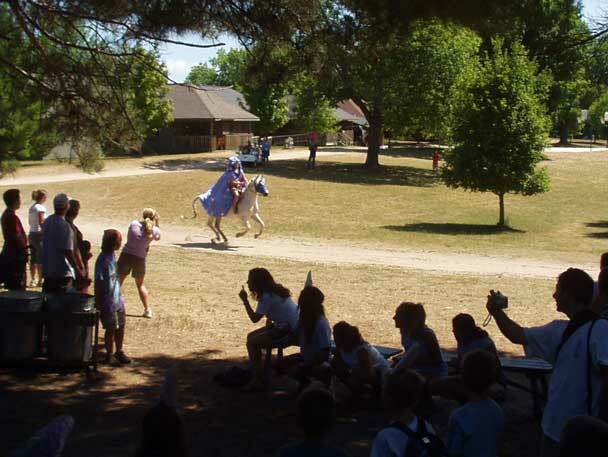 Perhaps the most well known legend at Michigania is that of the Unicorn. The magical creature tends to make appearances near the end of the week and is usually seen running past arts and crafts. It really enjoys children's voices and comes when they sing. Usually, the wizard that rides the unicorn gives out a bag of goodies to the children. 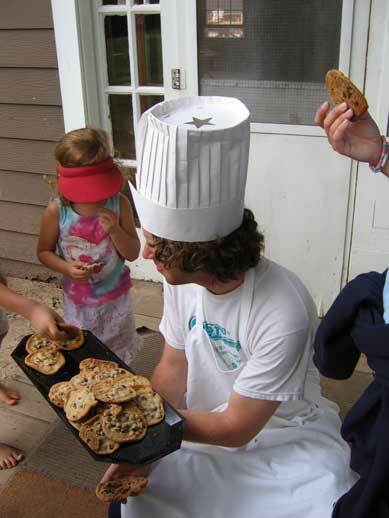 There is a man who lives in one of the large industrial ovens named cookie man who comes out daily with cookies for children if and only if they sing loudly enough. The cookies are exceptionally good. Underneath the bridge between the Nursery and the nature center lives a strange and mysterious troll. It seems to be harmless and is rarely seen at all. There have been sightings recorded mostly after the sun goes down. Puff the magic dragon lives in Walloon lake and makes the wind. The boating staff gets mad at Puff when there is no wind and they praise him when there is wind. During 3rd week in 2005 during the 5-6's Ensign ride, Jessica Putman was actually pulled into the lake by the dragon during an attempted communication. He is a 1st week camper who used to be the maintenance assistant. Check the boards in the cafeteria for his picture around 1987. He's now an electrical engineer. He hangs out at rifely a lot. You can usually find him shooting things, chasing away bear, and moving hills around for the fun of it. His family is amazingly cool. He's so cool that he is a legend. "I was out mowing the grass over in South Camp when there he was! Out of nowhere, he came riding out of the woods in cape and mask. I thought it was Zorro at first but then I noticed the wings of the batmobile and heard a faint theme music playing. I tried to catch up to see what he was doing but he was just too fast. Like lightning!" The rivalry with Camp Daggett can be hilarious, but it also can be annoying. It's hilarious when Jerome Rand sends out a whaler with a large inflatable shark tied to the back and circles the canoeing Camp Daggett people on their way to wildwood forest. It's annoying when the Camp Daggett people steal the Michigania signs from the road. Jerks! I mean, that's not nice at all. Then, Lyle has to go get the pattern and cut out a new sign and paint it up. I'm going to try to persuade Lester to drag the torches out there and make a more permanent fastener. There is a mean weasel that eats ground squirrels in the horse pasture and in the archery range. It's sort of cool looking, but it's mean because it eats those cute little squirrels. This thing is not even a legend. It's just a weasel. "I'm nominating another animal as a legend at camp michigania: the Skunk on the hill. I figure the skunk should get an equal call as the weasel. That skunk is not afraid of anyone. I saw it on the hill one night and I got within 10 ft before it started to saunter back towards its hole. And I'm pretty sure someone got sprayed by it. I almost got sprayed by it one night when I went into the boat house around 10. I turned on the light and I saw this fat skunk try to get out but it went to the wrong corner and got scared and did a handstand. When a skunk does a handstand that means its going to spray. Its a good thing I knew that and that it just wasn't some circus trained skunk because I ran out the door so fast. After that anytime I went into the boat house before I did I would sing a song or stomp my feet really loud just in case the skunk was back in there so it would have some time to get out before I got in." There seems to be a common belief that the lake that Michigania is on is called "Lake Walloon" when in fact it is called "Walloon Lake." It used to be called Bear lake and before that it was Michimagua or something. That song written by a camper used "Lake Walloon" to rhyme with the word "moon" or something and it has stuck with campers and staff ever since. Now, there's nothing wrong with calling it lake walloon amongst each other, but if you are talking to anyone who knows Walloon Lake and you call it Lake Walloon, they might think you are ignorant or something. I grew up on the Lake and my grandpa has had a place on the lake since the 1940s or before and I cringe with the words "Lake Walloon" I don't really know why. It just isn't the name. So please go ahead and call it Walloon Lake and make everyone happy.